Join the discussion on our forums! 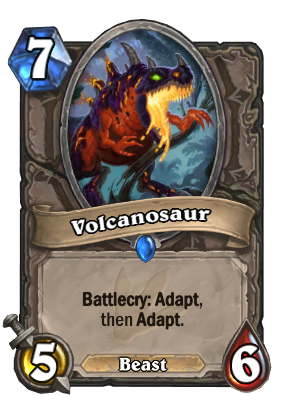 Come discuss Volcanosaur over in our dedicated Volcanosaur discussion topic. Always fun to say out loud "VOL-CA-NO-SAUUUR!" This is my new favorite arena card. The only late game minion that stands a chance against mages. Just Liquid Membrane and watch them hover over it in frustration. SOOOOO SATISFYING. Volcanosaur has actually been really good in my Zooish Handbuff Paladin. Buffed once before hitting the board, you're basically only paying 1 more mana for a Boulderfist Ogre that gets to Adapt twice, (and is a Beast, which means Curator can draw it). Buffed 2+ times in hand, it can be depressingly close to Galvodon's effective power, without having to weaken your deck by putting the quest and buffs in it. Ladies and gentleman, I present to you Indominus Rex! Wait...where is she? I tried this card today. And i have doubt. I don't know if this is bug or something? I tried it with Brann Bronzebeard but i am getting repeated discover options. Like one time i was able to select windfury 3 times. But in battle windfury works only one time. Rather than 3 times. But that's not important. What my doubt is - I get 4 times discover option with Brann Bronzebeard. What if i chose 3 different options first 3 times and on 4th time i get same 3 options to chose from? I know its rare possibility. But isn't one of my adapt option going to be wasted? You can't have two windfury abilities active at the same time. If you try to give windfury to a dragonhawk, all it will do is replace the original windfury. Legendary Mech V-07-TR-0N has a mega-windfury that attacks four times per turn, but that's unique to him so far. That's not what he's saying. He's saying that if you choose Taunt, Divine Shield, and Poisonous, then you have a chance of being screwed if your last Adapt is between Taunt, Divine Shield, and Poisonous. However, OP, it should be noted that with most of them being Stat increases (or there being a great number of stat increases in there), this likely won't happen all that often, and the card/Adapt keyword wasn't meant to be used with Brann Bronzebeard anyway. The three keywords is likely enough, even if it isn't ideal.